MRO TOOLS Cleco Fastener Sets offers incredible value with its durable, polyester carry bag (6'' H x 8.5'' W) to hold your Clecos and a pair of Cleco Pliers that are designed for installing spring-loaded fasteners. MRO TOOLS Cleco Fasteners are widely used in automotive, racing, and aircraft sheet metal repair. MRO TOOLS Cleco Fasteners are spring-loaded and steel bodied fasteners that are designed to temporarily fasten multiple sheets of material together before the pieces are permanently joined. MRO TOOLS Cleco Fasteners are a simple and inexpensive alternative to competitive fasteners and are available in various lengths and strengths to accommodate different processes. MRO TOOLS Cleco Kit of 50 standard (K5/32) 0-1/4'' grip plier operated Cleco fasteners plus Cleco Pliers. The plier-operated (K) series sheet holder clamp is the standard temporary fastener solution. MRO TOOLS Cleco Kit of 100 standard (K5/32) 0-1/4'' grip plier operated Cleco fasteners plus Cleco Pliers. The plier-operated (K) series sheet holder clamp is the standard temporary fastener solution. MRO TOOLS Cleco Kit of 150 standard (K5/32) 0-1/4'' grip plier operated Cleco fasteners plus Cleco Pliers. The plier-operated (K) series sheet holder clamp is the standard temporary fastener solution. MRO TOOLS Cleco Kit of 200 standard (K5/32) 0-1/4'' grip plier operated Cleco fasteners plus Cleco Pliers. The plier-operated (K) series sheet holder clamp is the standard temporary fastener solution. MRO TOOLS Cleco Kit of 250 standard (K5/32) 0-1/4'' grip plier operated Cleco fasteners plus Cleco Pliers. The plier-operated (K) series sheet holder clamp is the standard temporary fastener solution. MRO TOOLS Cleco Kit of 300 standard (K5/32) 0-1/4'' grip plier operated Cleco fasteners plus Cleco Pliers. The plier-operated (K) series sheet holder clamp is the standard temporary fastener solution. MRO TOOLS Cleco Kit of 350 standard (K5/32) 0-1/4'' grip plier operated Cleco fasteners plus Cleco Pliers. The plier-operated (K) series sheet holder clamp is the standard temporary fastener solution. MRO TOOLS Cleco Kit of 400 standard (K5/32) 0-1/4'' grip plier operated Cleco fasteners plus Cleco Pliers. The plier-operated (K) series sheet holder clamp is the standard temporary fastener solution. MRO TOOLS Cleco Kit of 450 standard (K5/32) 0-1/4'' grip plier operated Cleco fasteners plus Cleco Pliers. The plier-operated (K) series sheet holder clamp is the standard temporary fastener solution. 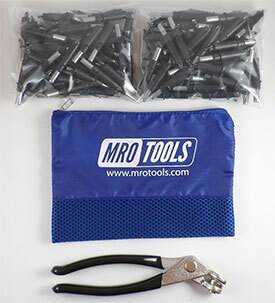 The MRO TOOLS K1S200-5/32 Standard Plier Operated Cleco Fasteners 200 Piece Kits w/ Cleco Pliers & Carry Bag is one of thousands of quality tooling products available from MRO Tools. Please browse Standard (K) 0-1/4'' Grip Plier Operated Cleco Fastener Kits for tools similar to the MRO TOOLS K1S200-5/32 Standard Plier Operated Cleco Fasteners 200 Piece Kits w/ Cleco Pliers & Carry Bag. MRO TOOLS K1S200-5/32 Standard Plier Operated Cleco Fasteners 200 Piece Kits w/ Cleco Pliers & Carry Bag description summary: MRO TOOLS Cleco Kit of 200 standard (K5/32) 0-1/4'' grip plier operated Cleco fasteners plus Cleco Pliers. The plier-operated (K) series sheet holder clamp is the standard temporary fastener solution. 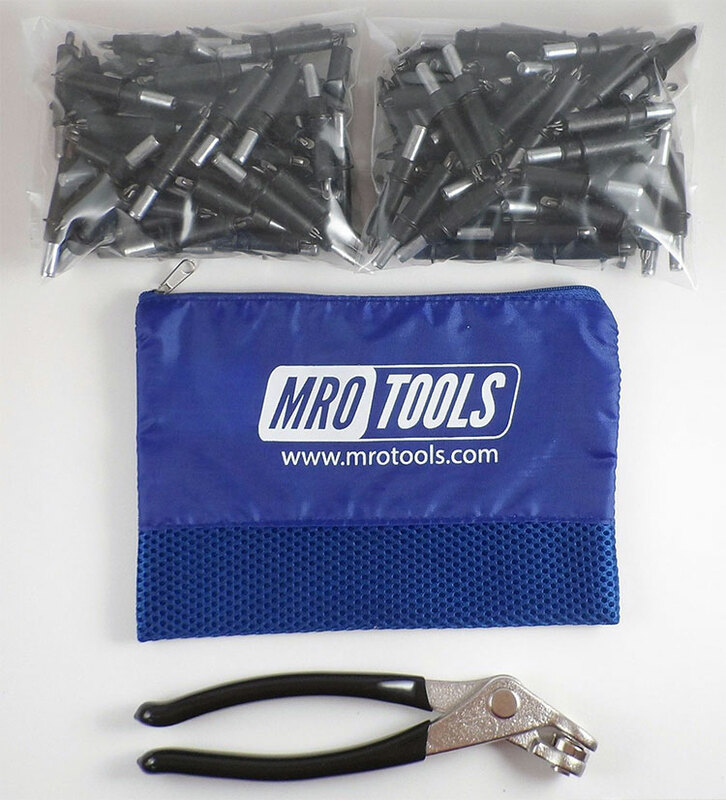 Quantity discounts may be available for the MRO TOOLS K1S200-5/32 Standard Plier Operated Cleco Fasteners 200 Piece Kits w/ Cleco Pliers & Carry Bag. Please contact MRO Tools for details.